Eustachian tube dysfunction (ETD) is one of the most common diagnoses in the Ear Nose and Throat office. ETD can be easily misdiagnosed and misunderstood, and often patients face overwhelming costs, undergo numerous exams, and failed treatments without much improvement of their ETD. Dr. Ronen Nazarian, a fellowship-trained ear surgeon, has dedicated much of his work to develop an ETD program to help effectively and safely diagnose and treat the various causes of ETD. Dr. Nazarian has gained a deep understanding and appreciation for the Eustachian Tube. Appropriate and timely treatment of ETD is the cornerstone for proper management of chronic ear disease. We have found that almost all patients with chronic ear disease, recurrent ear infections, cholesteatoma, and ear drum issues have some underlying Eustachian tube dysfunction that has never been properly addressed. How do I know if I have ETD? ETD is often misdiagnosed due to subtleties in exam findings. Many general ENT physicians do not perform the appropriate testing required to identify this disorder. A thorough history and physical exam by an otologist is required to diagnosis Eustachian tube dysfunction. A hearing test are often necessary to differentiate Eustachian tube dysfunction (ETD) from other similar problems. A feeling that your ears are clogged or "under water"? Crackling or popping sounds in the ears? A feeling that your hearing is muffled? What can ETD be confused with? What should I expect during my visit for ETD consultation? All of these exams can be done easily and safely in our clinic setting. It is essential to undergo some of these tests in order to properly diagnose and avoid unnecessary or wrong treatment. It’s our priority to choose the treatment that is the most cost-effective, safe, and appropriate for you. What can happen if I don’t treat my ETD? The Eustachian tube is a small tube that connects your ear to your nose. This tube is important for pressure equalization into the middle ear. You might have noticed your Eustachian tube functioning when yawning, swallowing, chewing, flying, driving at high altitudes, or scuba diving. When the Eustachian tube opens, there is usually a click, referred to as your ears “popping” accompanied by relief of pressure in the middle ear. The Eustachian tube becomes dysfunctional when it is congested and its movement is restricted. It becomes hard to open the Eustachian tube by the normal processes of yawning or swallowing, and even forceful equalization of the Eustachian tube becomes hard to perform. When the Eustachian tube stops functioning properly, it can lead to ear pressure, fullness, hearing loss, abnormal clicking, and even pain. 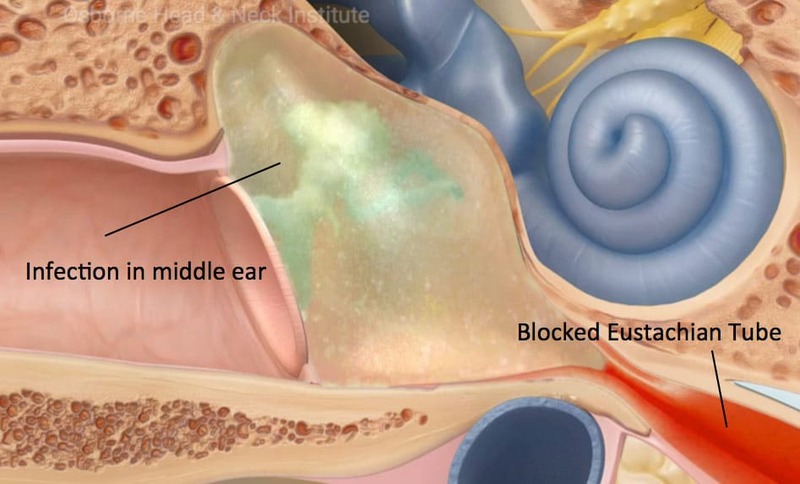 Since the ear depends on the Eustachian tube for drainage, Eustachian tube dysfunction can also lead to accumulation of infection and fluid in the middle ear, or otitis media. Because the ear is connected to the nose through the Eustachian tube, many people with allergies and sinus issues can also have Eustachian tube problems. A thorough history and physical exam by an otologist (link to ohni.org, bio page for nazarian) is required to diagnosis Eustachian tube dysfunction. A hearing test are often necessary to differentiate Eustachian tube dysfunction (ETD) from other similar problems. ETD is often misdiagnosed due to subtleties in exam findings. Many general ENT physicians do not do the appropriate testing required to identify this disorder. What are some possible treatments of Eustachian tube dysfunction? When scuba divers descend, they may experience symptoms commonly referred to as “ear squeeze.” This happens when the pressure in the middle ear and the outside atmosphere differ. The pressure of the outside environment is higher and therefore pushes inwards on the eardrum, which feels like the ear is being squeezed. This is a normal phenomenon and does not cause injury unless ear pressure does not equalize. If pressure does not equalize, the eardrum may rupture and cause severe symptoms, including hearing loss, tinnitus, dizziness, nausea, and vomiting. What happens to my ears when I scuba dive? As a diver descends deeper into the water, the outside pressure increases, and is higher than the pressure in the diver’s middle ear changes. That pressure continues to build until the Eustachian tubes (the body’s natural pressure release mechanism) open and equalize the pressure. How can diving affect my ears? When diving, it is important to not ignore “ear squeezing.” That symptom suggests the ears have not yet equalized pressure and that the Eustachian tube has not yet done its job. Experienced divers know how to gently exhale against plugged nostrils to force the Eustachian tube open so that air can enter the ear and equalize the pressure. This is because the structures critical for balance are located near the middle ear. The entry of cold water into the middle ear triggers a response in these structures, causing dizziness. Dizziness is severe and will cause nausea and vomiting. This is potentially life-threatening to the underwater diver. How can I prevent ear injury while diving? Immediately stop their dive if they feel pain in their ears or cannot clear their ears out while on a dive. Equalize their ears before and during the descent. It is advised that anyone who dives regularly consult with an otologist to manage any ear symptoms associated with diving. If you suffer from ETD and planning to fly to Los Angeles for treatment (or planning any general flight), you may need to take special precautions to help prevent any pain or uncomfortable pressure in your ears. Use Afrin Nasal Spray in your nostrils 2 times on each side, one hour before the plane takes off. If your flight is longer than 5 hours, we recommend spraying your nose again 1 hour before landing. If you do not have any heart, kidney problems, or hypertension, then you should also take 30 mg of Sudafed, one hour before the plane takes off. If a flight is longer than 8 hours, you may want to take another Sudafed 1 hour before landing. Both of these medications can be bought over-the-counter in a drugstore or pharmacy. You should NOT fly if you have an upper respiratory infection. How do I unblock my ears during the flight? The act of swallowing activates the muscle that opens the Eustachian Tube (the small tube that leads from the back of your nose, to the inside of the ear), and allows pressure to equalize. You swallow more often when you chew gum or let a hard candy dissolve in your mouth. These are good practices, especially just before and during descent. Yawning is even more effective than swallowing at equalizing ear pressure. Try to avoid sleeping during descent; you may not swallow frequently enough while sleeping to keep up with the Eustachian Tube pressure changes. You may have to repeat this several times during descent. It is important that you not force past pain to unblock your ears in this way. If you are unsure about the amount of pressure to use, it is best to avoid this maneuver until you are instructed further by your otologist. We hope this helps you with your discomfort and allows for a safe and painless flight. Please feel free to contact us with any questions, concerns, or problems that may arise during your trip. Once diagnosis has been established, and more serious problems have been ruled out, medical therapy can be instituted. This may include nasal steroid sprays, anti-histamines, nasal irrigations, corticosteroids, and other decongestants, depending on your individual findings. Your otologist may also want to perform additional testing to determine if there are other treatmetn options that will help you decrease the symptoms of ETD. Each patient is different and should be treated on an individual basis. It is important to speak to your doctor first to determine which treatment will result in optimal outcomes with minimal side effects. Smoking is a very potent irritant that can exacerbate Eustachian tube dysfunction. An easy way to improve Eustachian tube dysfunction dramatically is to quit smoking cigarettes and any other inhaled smoke or vapor. There are also maneuvers that patients can utilize, called auto-insufflation, which is the process of blowing air through your nose into your ears. This can help relieve built up pressure in the ears, especially when changing altitudes. Other practices such as yawning, chewing gum, and swallowing while pinching the nose shut can help keep the Eustachian tubes from closing. Sometimes, an allergy test may reveal an avoidable allergen such as a certain food or animal. By avoiding certain allergens, inflammation and swelling in the Eustachian tube can improve and thus restore function. If it is detected that you are allergic to certain unavoidable allergens such as pollen, dust, trees, or weeds, your doctor may offer immunotherapy. Immunotherapy is a customized process wherein the body develops a higher tolerance for allergens. After several months, symptoms of blockage and inflammation may resolve because the immune system is no longer trying to fight the allergen. The Eustachian tube is a narrow passage surrounded by bone, muscle, and cartilage. The balloon works to spread and dilate this tissue and widen the tract of the tube so that air can pass more freely between the nose and the middle ear. By dilating the Eustachian tube, the symptoms of ear fullness, pressure, clicking, and muffling can be improved. Furthermore, balloon dilation can resolve chronic ear infections and improve symptoms of pain and pressure when flying. An evaluation by an otologist (ear specialist) is recommended to determine if this procedure is appropriate for you. What diagnostic tests are required before the procedure? The balloon dilation procedure can be performed either in the office under local anesthesia, or in the operating room with general anesthesia. The procedure is quick and patients go home the same day. Under endoscopic guidance, the surgeon will dilate the Eustachian tube through the nose. After adequate dilation, the stent and camera are removed from the nose. There are no incisions made during this procedure and no materials are left in the patient. Unlike myringotomy tubes, which are commonly used to treat ETD, the balloon dilation procedure allows the Eustachian tube to gain back its function without leaving any implants or stents in the ear. Myringotomy tubes are used to temporarily ventilate the middle ear, but they do not help solve the fundamental issue of Eustachian tube dysfunction. Balloon dilation can help restore the natural function of the Eustachian tube. How is the recovery from this procedure? Recovery is quick and painless. You should be able to return to your normal activity the following day. There are no incisions involved with this surgery, resulting in a shorter healing time. The Eustachian tube bypass procedure is designed as a long-term solution for patients who have chronic Eustachian tube dysfunction (ETD) and recurrent middle ear infections. It involves a special tube that ventilates the middle ear through a tiny tunnel in the ear canal. How do I know if I’m a candidate for the bypass procedure? The procedure is offered to patients who have already needed several myringotomy tubes in the past and continue to suffer from Eustachian tube dysfunction. Typically, the patients have had ETD for many years. The surgery is especially offered to patients who no longer want to have repeated myringotomy tubes. There are patients with poor middle ear ventilation for whom traditional tubes are not advisable. In these patients, poor ventilation may result in the eardrum being pulled inwards (retraction, atelectasis), making it difficult or inadvisable to place a regular tube. The bypass tube allows the eardrum to heal, giving the patient more options in the future. What is the difference between the tube used in bypass procedure and a regular myringotomy tube? In a typical myringotomy procedure, a small tube is placed through an incision in the ear drum to help drain and ventilate the middle ear. If needed several times, it can lead to scarring, retraction, and damage to the ear drum. Because a myringotomy tube lasts 6-12 months and does not cure the Eustachian tube issue, a person with chronic ETD usually needs multiple tubes over their lifetime. This constant manipulation of the eardrum may result in more scarring, discomfort, and hearing loss. The Eustachian tube bypass procedure uses a specialized tube that ventilates the middle ear through a small tunnel in the bony ear canal. It does not require any incision on the ear drum, so it minimizes any hearing damage to the ear. Unlike the classic myringotomy tube, which can fall out after 6 months, the Eustachian tube bypass procedure involves a tube that can permanently stay in the ear without falling out. What kind of anesthesia is used for this surgery? The procedure is minimally invasive and is performed under general anesthesia. The surgery does not require overnight admission. The recovery period is very short, and patients return to normal activity by the next day. How soon can I fly after the procedure? Most patients can fly within 3-5 days after the procedure. It takes about a week for the skin around the tube to fully heal at which point you will be hearing and ventilating better. What is a drug-eluting stent? Drug-eluting stents in the Eustachian tube emit a steroid medication to decrease swelling, congestion, and obstruction of the lining. The stent is fully dissolvable, and usually is absorbed by one week. What are the benefits of using the drug-eluting stent for the Eustachian tube? Many people suffer from Eustachian tube dysfunction and do not get relief from medical therapy such as nasal sprays and decongestants. This may be because inflammation and swelling are too severe, or because the nasal sprays cannot reach the Eustachian tube. By inserting a stent through the Eustachian tube opening, the deeper parts of the tube are treated and mechanically opened with the stent. This results in resolution of Eustachian tube swelling. The procedure is performed on an outpatient basis, and there are no incisions made. The entire procedure is performed through the nose, with the use of an endoscopic camera. The patient will go home the same day, and usually has minimal pain or side effects. How do I know if I’m a candidate for the drug-eluting Eustachian tube stent? If your doctor has diagnosed you with Eustachian tube dysfunction and you have had minimal relief of symptoms with medical therapy, the drug-eluting stent may be a good option. Consultation with an otologist will help you determine if this procedure can alleviate your symptoms. Patulous Eustachian Tube is a condition where the Eustachian tube remains open for too long and too often. This creates the unsettling feeling of pressure or hearing your own heartbeat and breathing in your ear. The condition is less common than typical Eustachian tube dysfunction, and diagnosis requires a detailed history and examination by an otologist. What are the symptoms of patulous Eustachian tube? The Eustachian tube connects the ear to the back of the nose. When the tube is too open, it makes it easier for air to flow between the nose and the ear. This can cause very irritating effects, including hearing yourself breathe, and hearing your own voice echo when you speak. What are some tests used to diagnose a patulous Eustachian tube? What are the causes of patulous Eustachian tube? Some patients simply have a naturally patulous Eustachian tube. However, sometimes the Eustachian tube becomes patulous after significant weight loss, pregnancy, or after starting certain medications that decrease your water weight (i.e., diuretics). What are the medical treatments for patuolous Eustachian tube? Are there any surgical treatments? If medical treatment is not successful in improving the symptoms of the patulous Eustachian tube, several procedures are available. These procedures are tailored to the patient’s specific anatomy and symptoms.